The Norman Landfill Environmental Research Site What Happens to the Waste in Landfills? This Factsheet is also available as pdf (949KB). We call it "garbage" or "trash" but it is "municipal solid waste" to your city government and the waste industry. Municipal solid waste is a combination of non-hazardous wastes from house holds, commercial properties, and industries. The U.S. Environmental Protection Agency (USEPA) reports that the United States produced about 230 million tons of solid waste in 1999, about 57 percent of which is disposed of in landfills (U.S. Environmental Protection Agency, 1999). Disposal of municipal solid waste in landfills was largely unregulated prior to the 1970s. Most solid waste was deposited in unlined pits. Precipitation and ground water seeping through this waste produces leachate, which is water contaminated from the various organic and inorganic substances with which it comes in contact as it migrates through the waste. Leachate seeping from a landfill contaminates the ground water beneath the landfill, and this contaminated ground water is known as a plume. The normal movement of ground water causes the leachate plume to extend away from a landfill, in some cases for many hundreds of meters. Many studies have shown leachate plumes emanating from old unlined landfills. Estimates for the number of closed landfills in the United States are as high as 100,000 (Suflita and others, 1992). Federal and state regulations were passed in the 1980s and 1990s to manage disposal of solid waste. Those regulations require that most landfills use liners and leachate collection systems to minimize the seepage of leachate to ground water. Although liners and leachate collection systems minimize leakage, liners can fail and leachate collection systems may not collect all the leachate that escapes from a landfill. Leachate collection systems require maintenance of pipes, and pipes can fail because they crack, collapse, or fill with sediment. The USEPA has concluded that all landfills eventually will leak into the environment (U.S. Environmental Protection Agency, 1988). Thus, the fate and transport of leachate in the environment, from both old and modern landfills, is a potentially serious environmental problem. The Norman Landfill (fig. 1) is a closed municipal solid waste landfill, formerly operated by the city of Norman, Oklahoma. The landfill is sited directly on the Canadian River alluvial aquifer and has no liner or leachate collection system, so a leachate plume has developed in ground water in the aquifer. The ground water and leachate plume flow away from the landfill toward the Canadian River, a large tributary of the Arkansas River that drains into the Mississippi River. The Norman Landfill was designated a research site by the U.S. Geological Survey (USGS) through its Toxic Substances Hydrology Research Program. Monitoring wells and instruments have been installed in and adjacent to the leachate plume. A small stream and wetland overlie the leachate plume, and studies are in progress to determine the fate of leachate compounds that enter the wetland from the ground water. USGS hydrologists and technicians have accomplished comprehensive site characterization, which provides a wealth of information about the site hydrogeology and geochemistry. This site characterization provides essential information to the scientists conducting research about the chemical, biological, and hydrologic processes in ground water and surface water affected by landfill leachate. Research is in progress at the site by scientists from the University of Oklahoma, Oklahoma State University, other universities, the USEPA, and the USGS. In addition to providing a laboratory for studies of ground and surface water contaminated by landfill leachate, the Norman Landfill Environmental Research Site is used to study other types of contaminant problems. The plume can be used to study microbiological and geochemical processes that are not specific to landfills. All research at the Norman Landfill Environmental Research Site is designed to investigate problems and processes that have a high transfer value to other subsurface contamination problems. Comprehensive physical, chemical, and microbial characterizations at this and other USGS Toxic Substances Hydrology Program sites provide fundamental knowledge of the processes that control important types of contamination problems. This knowledge of fundamental processes can be generalized to a wide range of field conditions by comparing results to field and laboratory experiments at other sites with differing conditions and properties. The resulting knowledge and methods improve the effectiveness and reduce the cost of characterization and remediation at contaminated sites across the nation. Can Microorganisms Reduce Landfill Contaminants? Scientists who investigate environmental contamination problems are interested in an environmental cleanup approach known as natural attenuation. Natural attenuation refers to naturally occurring physical, chemical, and biological processes that can reduce concentrations of contaminants. In most contaminated aquifers, one aspect of natural attenuation involves the degradation of contaminants by microorganisms, which in some instances prevents contaminant migration. These microorganisms are naturally present in aquifers, even deep below the surface of the earth. Natural attenuation can be a better alternative for remediation of certain types of contaminants compared to other methods of remediating contaminated ground water. Natural attenuation can be less expensive and more effective than other methods, such as extracting contaminated ground water with wells and treating it at water treatment plants. Much of the research at the Norman Landfill Environmental Research Site investigates different aspects of natural attenuation. Where Does Natural Attenuation Occur? University of Oklahoma and USGS scientists used a combined microbiological and geochemical approach to identify the important processes occurring in the aquifer contaminated by leachate from the Norman Landfill (Cozzarelli and others, 2000, Harris and others, 1999). The combined sciences of microbiology and geochemistry are called biogeochemistry. The Norman Landfill researchers identified zones in the leachate plume at Norman Landfill where different biogeochemical processes are occurring. One method to identify different biogeochemical zones is to measure the concentration of certain chemicals and minerals, those that are involved in biogeochemical processes, in the ground water and in the aquifer. Electron acceptors are minerals or chemicals that can occur naturally in aquifer solids or ground water, such as iron oxides in the sediments or sulfate dissolved in ground water. These chemicals are called electron acceptors because microorganisms transfer electrons to them during respiration, which is part of the process the microorganisms use to obtain energy. During respiration, an electron is transferred from an electron donor, such as an organic contaminant compound, to an electron acceptor. This electron transfer occurs when microorganisms break down organic contaminant compounds. The availability of electron acceptors in an aquifer is therefore an important factor for evaluating the effectiveness and sustainability of natural attenuation in contaminated aquifers. Some evidence of natural attenuation at Norman Landfill is shown in figure 2 (Cozzarelli and others, 2000), illustrated as generalized hydrogeologic sections through the leachate plume in the aquifer. The three illustrations within figure 2 show chemical concentrations of important indicators of natural attenuation processes along the same vertical slice of the aquifer. These illustrations demonstrate that the leachate plume begins near the surface (on the left side of the figure), where the solid waste is stored in the landfill. Ground water flows to the south toward the Canadian River. The leachate plume migrates toward the bottom of the aquifer as it flows toward the river. Figure 2. Concentrations of electron acceptors and donors in the Norman Landfill leachate plume. Sulfate occurs naturally in ground water in the Canadian River alluvial aquifer. Sulfate is depleted in the center of the leachate plume (fig. 2A) because the microorganisms use sulfate as an electron acceptor. When microorganisms transfer electrons to sulfate, sulfate changes chemically to form dissolved sulfide or hydrogen sulfide gas. The highest rates of sulfate reduction have been measured at the plume boundaries, such as where fresh water from rainfall infiltrating the aquifer mixes with the contaminant plume (Cozzarelli and others, 2000), and causes the sharp concentration gradients observed in figure 2A. The degradation of organic contaminants occurs most rapidly at the plume boundaries. Iron occurs naturally as mineral coatings on sediments in the Canadian River alluvial aquifer. Dissolved iron concentrations increase in the leachate plume (fig. 2B) because microorganisms transfer electrons to the iron on the mineral coatings, which contain insoluble ferric iron, while degrading the organic contaminants. With the addition of an electron, the iron is reduced to ferrous iron, which dissolves in water. Although the solid-phase electron acceptor (ferric iron) cannot be measured in the ground water, the detection of the end product of the reaction (ferrous iron) in water provides evidence that iron reduction has occurred. The concentration of non-volatile dissolved organic carbon (NVDOC) is shown in figure 2C. NVDOC is a measure of the organic contaminant compounds in the landfill. In the center of the plume, the concentration of NVDOC shows little change with distance, indicating that NVDOC is not efficiently degraded in this zone. 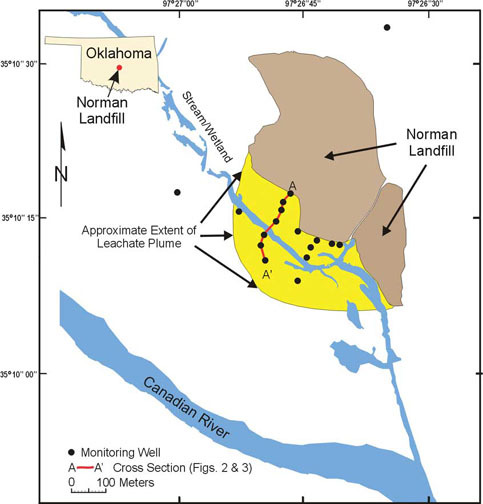 Researchers at Norman Landfill have learned that most of the natural attenuation occurs at the boundaries of the plume where electron acceptors are available. Sulfate concentrations are low in the center of the plume, as are measured rates of iron and sulfate reduction. The natural attenuation capacity of the aquifer, that is, its ability to attenuate contaminants, is depleted in the center of the leachate plume because microorganisms have used all the electron acceptors during migration of the leachate plume. USGS scientists have been investigating volatile organic compounds (VOCs) in the leachate at Norman Landfill (Eganhouse and others, 2001). VOCs are organic compounds that tend to vaporize at room temperature and pressure. Examples of VOCs include some of the compounds in gasoline, lubricants, paints, and solvents. Some VOCs are highly toxic or carcinogenic. VOCs end up in landfills in many ways, including the disposal of ordinary household items such as cleaners or marking pens. Although VOCs make up less than 0.1 percent of the mass of organic carbon in the leachate plume, they are useful indicators of natural attenuation. At Norman Landfill, USGS scientists compared concentrations of two different alkylbenzene isomers, n-propylbenzene and i-propylbenzene, in landfill leachate. Isomers of alkylbenzene have the same number and type of atoms, but the molecules have slightly different chemical structures. These different isomers have similar physical properties, so they should be affected by volatilization, dilution, and sorption in a similar manner. The concentration of n-propylbenzene decreases much faster as leachate flows away from the landfill than does the concentration of i-propylbenzene (fig. 3). This decrease in concentration of n-propylbenzene is caused by biological degradation, indicating that biologically mediated natural attenuation is decreasing the concentrations of some contaminants at Norman Landfill. This technique of comparing alkylbenzene isomers as indicators of biological processes can be applied at sites with contaminants other than landfill leachate. Figure 3. 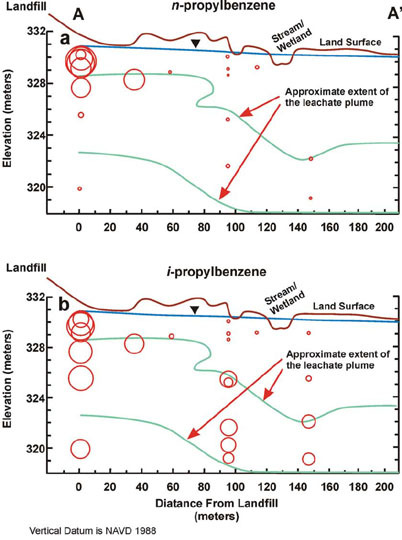 Distribution of the alkylbenzene isomers (a) npropylbenzene and (b) i-propylbenzene in the leachate plume at Norman Landfill. Concentrations in micrograms per liter (µg/L) are proportional to bubble diameter. Maximum concentration: n-propylbenzene = 0.80 µg/L, i-propylbenzene = 1.24 µg/L (from Eganhouse and others, 2001). Field experiments are being carried out at Norman Landfill to investigate how the rate of natural attenuation may vary with aquifer permeability (permeability is a measure of the ability of a material to transmit fluid). These experiments use push-pull or single-well injection-withdrawal tests (Istok and others, 1997). During the injection phase of the test, a solution consisting of ground water amended with tracers, electron donors, or electron acceptors is injected or "pushed" through a well into the aquifer. During the extraction phase, the test solution is pumped or "pulled" from the same well. Concentrations of tracers, reactants, and possible reaction products are measured as a function of time in order to construct breakthrough curves, measure reaction rates, and to compute mass balances for each solute. These tests can be conducted anywhere in the aquifer, making it possible to investigate processes and rates in different geologic textures and geochemical environments. Push-pull tests were conducted at Norman Landfill to measure biodegradation rates of simple organic acids in the leachate plume (Scholl and others, 2001). Wells were drilled into layers of three different types of sediments (medium sand, silt/clay lenses in sand, and poorly sorted gravel), each with a different permeability. Biodegradation rates of two simple organic acids, formate and lactate, were compared in the three different zones in the anoxic leachate plume at the site. These organic acids were used as microbial process indicators because they degrade at different rates depending on the dominant microbial processes. A conservative tracer (bromide) and the two organic acids were added to 50 or 100 liters of contaminated ground water pumped from each test well. The mixture was then re-injected and allowed to mix with the natural ground water. Daily samples were taken from the injection well until organic acids could no longer be detected. Although complete disappearance of the formate and lactate occurred within 7-9 days in all the wells, there were differences in degradation patterns. The results of the test show that the loss of lactate was due to natural attenuation and that there are differences in the rate of natural attenuation in areas of different permeability. These variable degradation rates may be related to microbial community structure, sediment chemistry, and water flow regime. Research at the Norman Landfill Environmental Research Site has shown that chemicals leaching from old unlined landfills are contaminating ground water, but that some of the contaminant concentrations are being reduced by natural attenuation. Modern landfills are designed to minimize contamination of ground water, but modern landfills eventually may leak contaminants into the environment. Research results from Norman Landfill will be useful to scientists and regulators trying to determine the effects of landfill leachate on the environment. Cozzarelli, I. M., Suflita, J. M., Ulrich, G. A., Harris, S. H., Scholl, M. A., Schlottmann, J. L., and Christenson, Scott, 2000, Geochemical and microbiological methods for evaluating anaerobic processes in an aquifer contaminated by landfill leachate, Environmental Science and Technology, v. 34, p. 4025-4033. Harris, S.H., Ulrich, G.A., and Suflita, J.M., 1999, Dominant terminal electron accepting processes occurring at a landfill leachate-impacted site as indicated by field and laboratory measures: in Morganwalp, D.W., and Buxton, H.T., eds., 1999,U.S. Geological Survey Toxic Substances Hydrology Program--Proceedings of the Technical Meeting, Charleston, South Carolina, March 8-12, 1999--Volume 3 -- Subsurface Contamination from Point Sources: U.S. Geological Survey Water-Resources Investigations Report 99-4018C, pp. 541-548. Istok, J.D., Humphrey, M.D., Schroth, M.H., Hyman, M.R., and O'Reilly, K.T., 1997, Single-well, "push-pull" test for in situ determination of microbial activities: Ground Water, v. 35, no. 4, p. 619-631. Scholl, M.A., Cozzarelli, I.M., Christenson, S.C., Istok, J., Jaeschke, J., Ferree, D.M., and Senko, J., 2001, Measuring variability of in-situ biodegradation rates in a heterogeneous aquifer contaminated by landfill leachate: EOS, Transactions, American Geophysical Union, v. 82, no. 20, May 15, 2001, p. 146. Suflita, J.M., Gerba, C.P., Ham, R.K., Palmisano, A.C., and Robinson, J.A., 1992, The world's largest landfill: Environmental Science and Technology, v. 26, no. 8, p. 1486-1495. U.S. Environmental Protection Agency, 1988, Federal Register, v. 53, no. 168, August 30, 1988, p. 33345. U.S. Environmental Protection Agency, 1999, Municipal solid waste in the United States: 1999 Facts and Figures —EPA530-R-01-014.